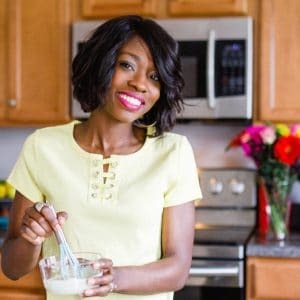 I’m bizack with another Instant Pot recipe…and I’m super excited to share this one because it’s such a quick and easy meal. It’s days like that that recipes in my Instant Pot are so important. 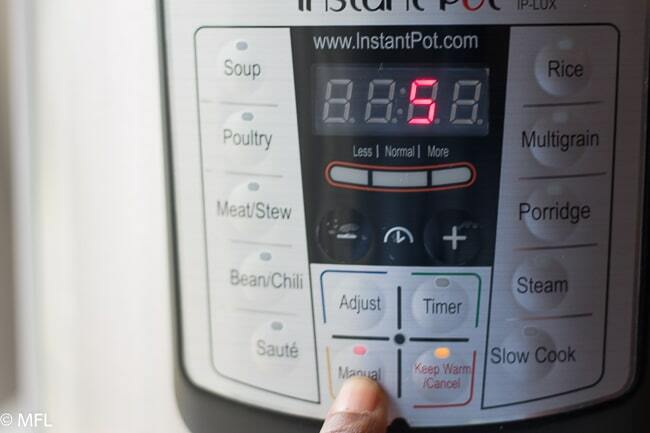 If you haven’t gotten an Instant Pot yet, you’re so missing out. It is one of my all time favorite kitchen appliances, outside of my oven. I go on and on about it in my post of Instant Pot Jamaican Cornmeal Porridge so I won’t do that again here. But for those that don’t know, it’s an electronic pressure cooker that pretty much cuts cooking time in half. It has a sauté function that makes it great for browning meats and softening onions that are part of meals. 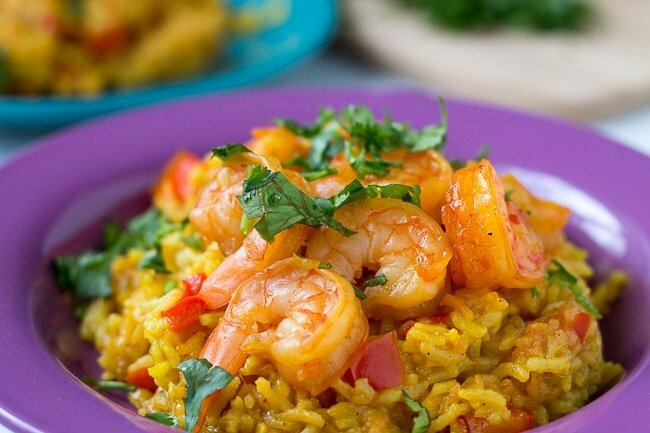 Alrighty, so about this Instant Pot pressure cooker shrimp paella. Well I always keep a bag of raw frozen shrimp in our freezer at home. I love frozen shrimp because the defrost time is so quick and the cook time of shrimp is so fast. 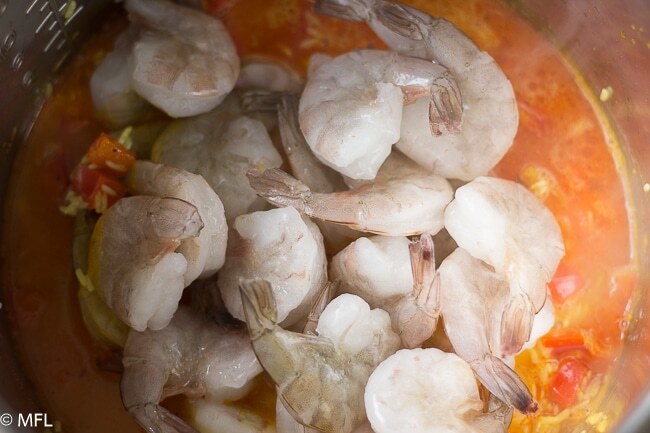 The great thing about this recipe is that you don’t even have to defrost the shrimp. It’s a literally a throw it in the pot kind of recipe. And if you prep your ingredients ahead of time by chopping the onions, peppers, and garlic…well my friend, you may break the record for the quickest dinner on the table. I remember the first time I made this for my family, my daughter literally was shocked and thought I ordered out and didn’t tell her. She couldn’t believe how quickly dinner was done. I just told her I was Super Mom. She was indeed impressed. 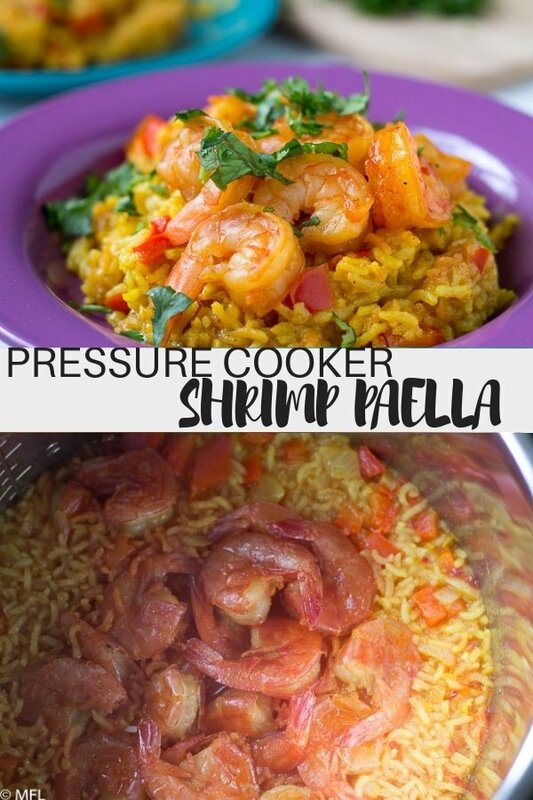 People don’t generally think of cooking shrimp in the pressure cooker. That makes sense because shrimp cooks quickly and if it’s not done right it can lead to a rubbery mess. The key to avoiding this of course is a short cooking time and using jumbo frozen shrimp with shell on. This will ensure your shrimp is perfectly cooked. The only slight annoyance with this recipe is the taking the shell off after cooking and before serving. Honestly, it’s up to you how you handle that part. On days I’m really tired, hubby and daughter are on their own when it comes to taking off the shells. On other days, I remove it for them so I don’t hear their whining. 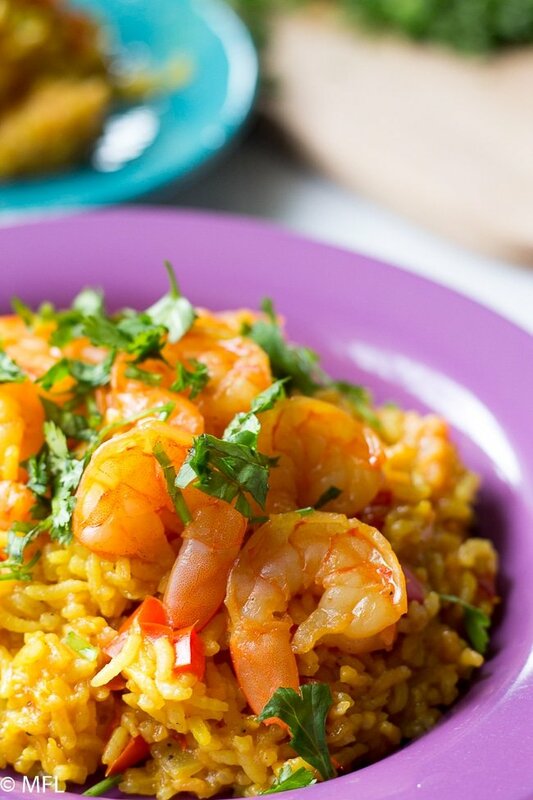 Make this Pressure Cooker Shrimp Paella in your Instant Pot for an easy and quick dinner. With only 5 minutes of pressure cooking time, this recipe is perfect for any night. 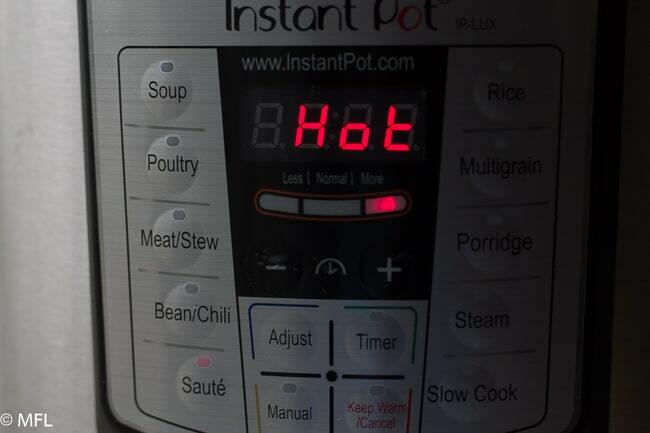 Set Instant Pot to Saute function. Add butter to pot and melt. 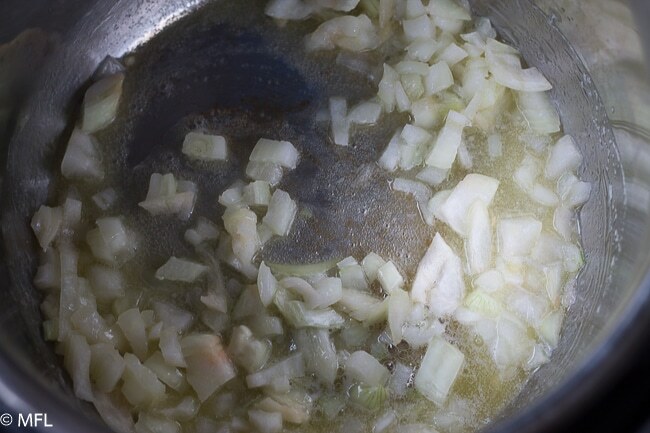 Add onions and cook until softened. Add garlic and cook for about a minute more. 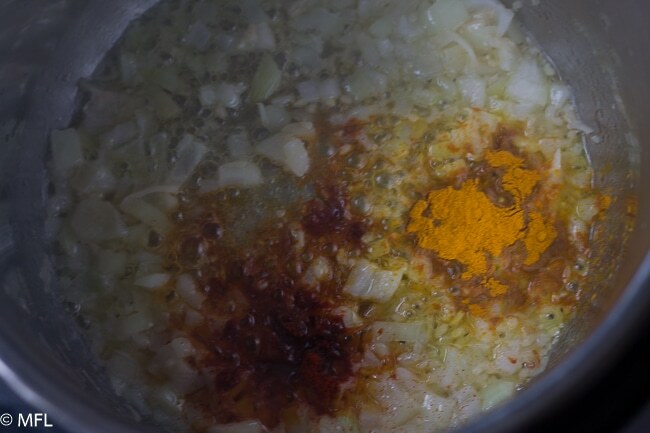 Add paprika, turmeric, salt, black pepper, red pepper flakes, and saffron threads. Stir and cook for about 1 minute. Add red peppers. Add rice and stir. Cook for about 30 seconds to 1 minute. Add chicken broth and white wine. Deglaze your pot by stirring to ensure that there is no food stuck to the bottom of the pot. Add shrimp on top. Turn off Instant Pot and cover. Make sure valve is set to sealing. 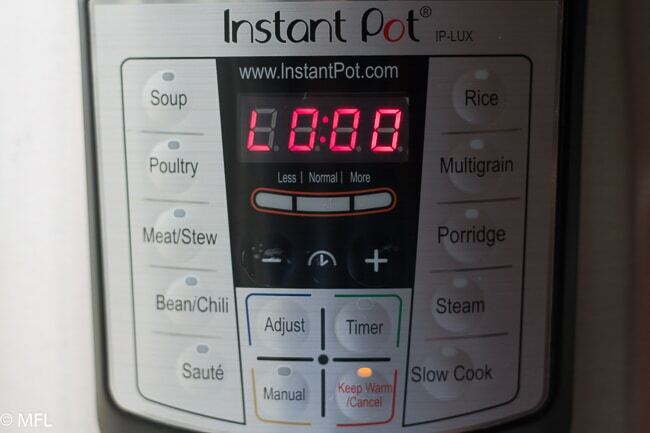 Set Instant Pot to Manual Mode and set a 5 minute timer. When done, quick release. Remove shrimp from pot and peel if desired. Serve with Cilantro. Make sure there are no dry bits stuck to the bottom of the pot. This could result in that annoying "burn" signal some pressure cookers give off. 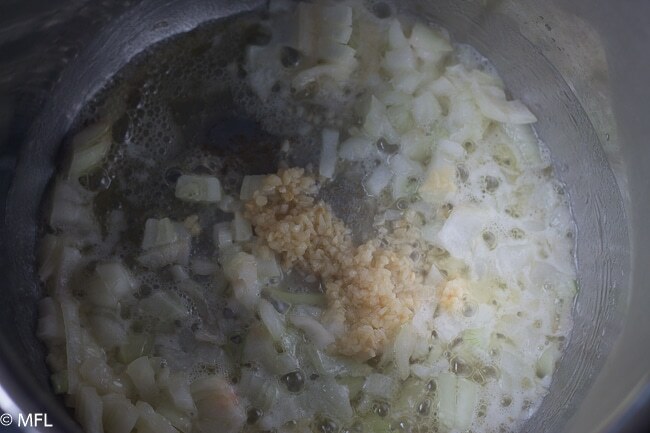 Once you add your broth (but before you place frozen shrimp on top), stir with a wooden spoon to ensure there is no food stuck to the bottom. Use raw jumbo frozen shrimp with the shell on. 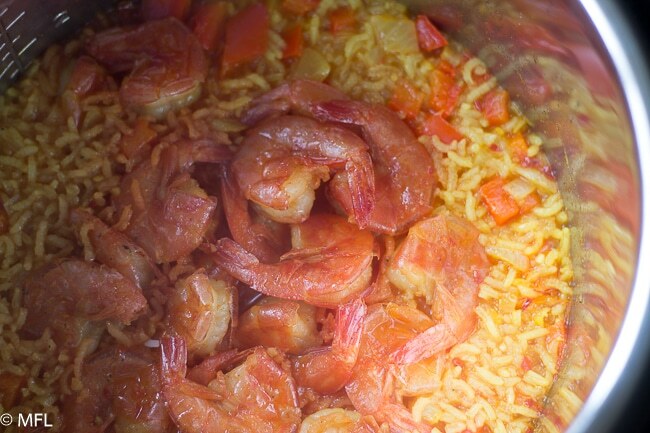 This will ensure that your shrimp is not overcooked and your rice cooks perfectly. 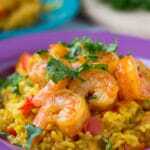 If you don’t have jumbo shrimp or it’s not frozen, then you will need to cook the shrimp seperatley. This recipe can be modified with many different vegetable or meat additions. There are some great modifications on the comments below. 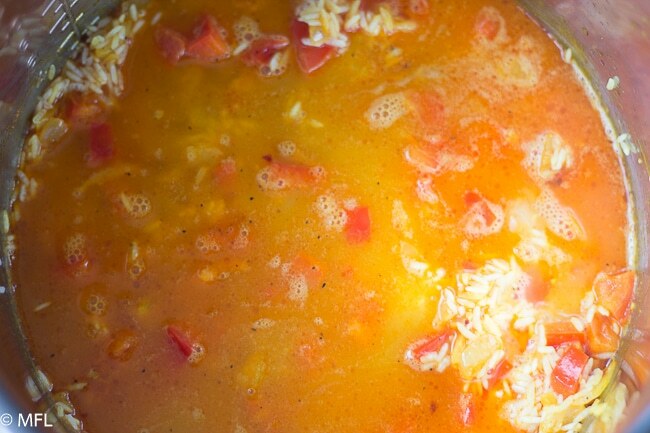 Rinsed rice…I find this is a must in every rice recipe I make. 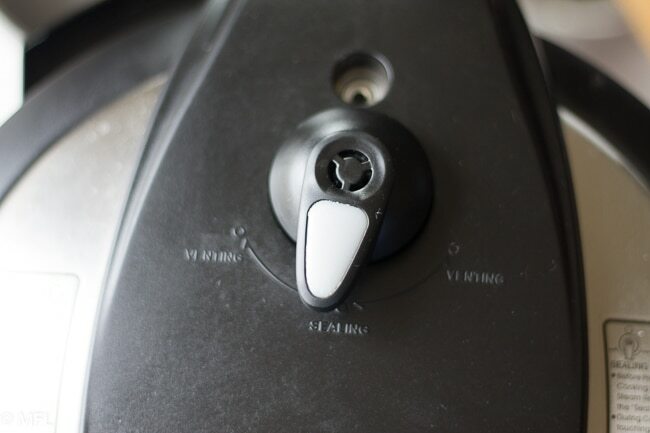 Press Sauté button on Instant Pot. It will automatically say 30 minutes. No need to adjust the time. 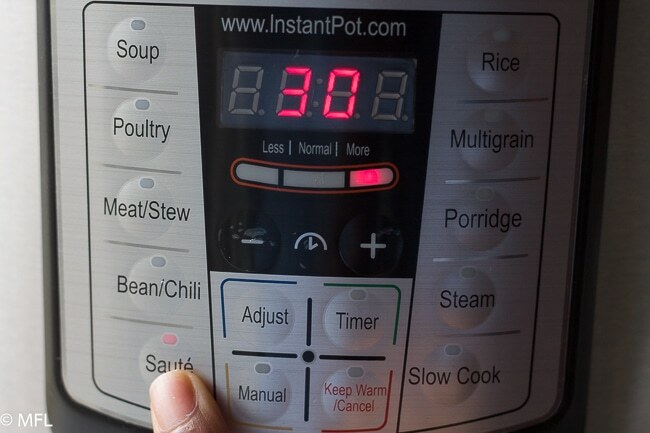 When Instant Pot says Hot, you are ready to add your ingredients. Add butter to melt. Add onions and stir. Cook until softened, about 3 minutes. Add garlic. Stir and cook for about 1 minute. Add spices and stir, cooking for about 1 minute. 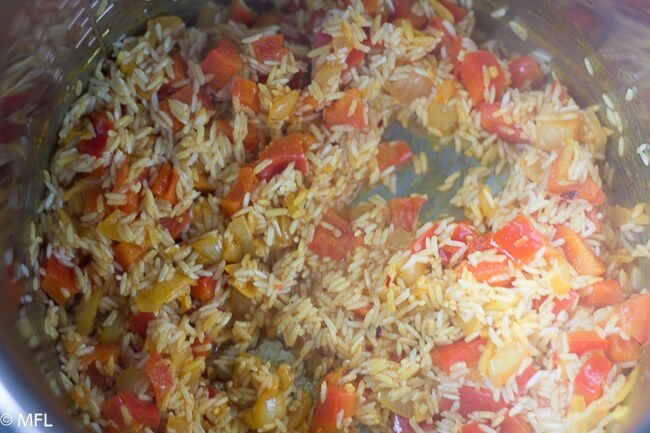 Add red peppers and rice and stir, Leaving to cook for about 1 minute. Add wine and chicken broth. Make sure the rice is all covered. Add frozen shrimp to the top, shells and tails on. Do not stir! Select the Manual Button and Adust the time to 5 by pressing the minus (-) button. This is how you start the Instant Pot and pressure will begin to build. The screen will then say “On” while pressure is building before the timer starts. 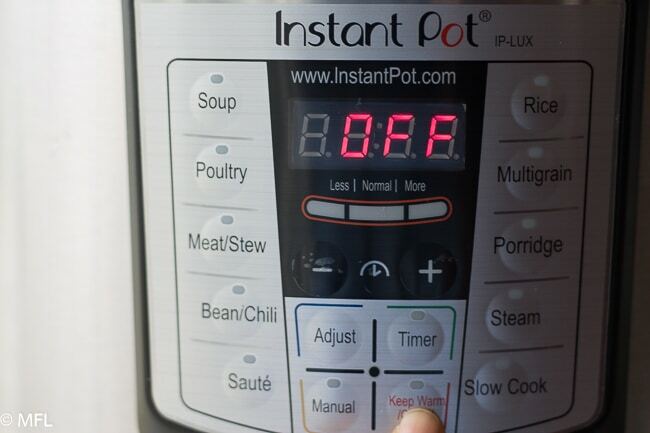 Once the timer is done, your Instant Pot will beep and your screen will look like this. This is when your natural release timer starts if you want to use it. We won’t be using natural release for this recipe. 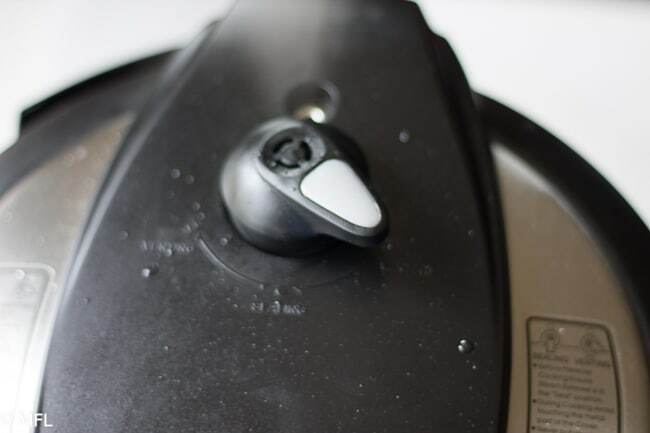 DO NOT OPEN THE INSTANT POT WHEN THAT LITTLE METAL CIRCLE IS UP. Too much pressure is in the pot. 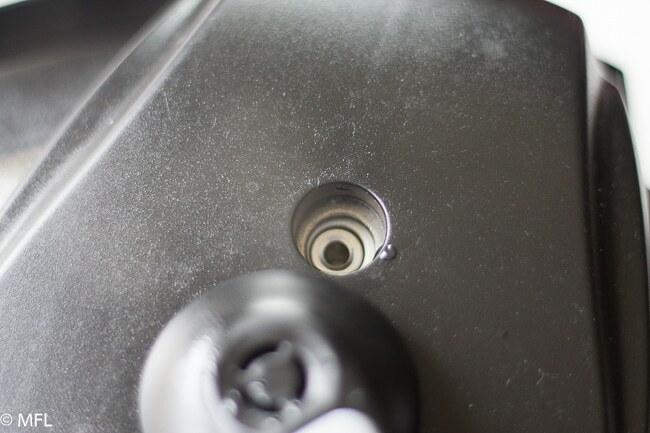 Once the little metal circle is completely down is when you can take off the cover. 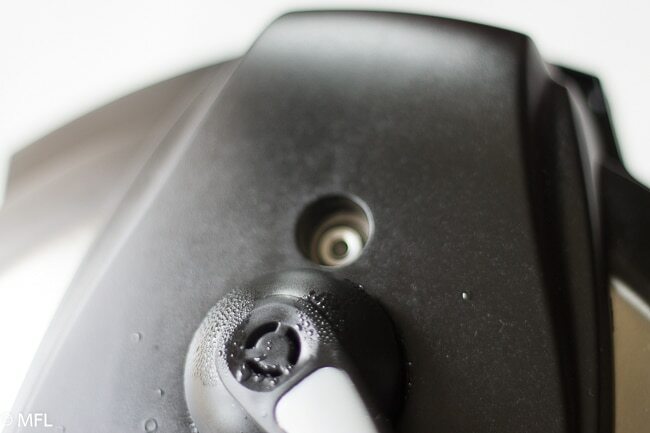 When the little metal circle is all the way down, your Instant Pot is ready to open. All done. You may remove shrimp and top and peel before serving. Adapted from Health Starts in the Kitchen. Just came from Barcelona so was craving for paella. Chanced upon this recipe and followed it to the letter. This was soooo good! Since I am not a fan of bellpepper I might omit it next time. Curious, what flavor does saffron add to the dish? It is pretty expensive! Anyway, want to ask, if I double the dish do I just double everything – liquid, spices and rice – but keep cooking time to 5 minutes? Want to make more in one cooking. Thanks in advance. Hi Cherry, So glad you liked it! I added the saffron because most authetic paella recipes call for it. The flavor from the saffron is so light that the dish can be made without it. Many people skip it all together and the dish works just fine. And yes, if doubling the recipe, keep the cook time the same. It may just take your machine a little longer to come to pressure. Yay, thanks for the feedback. So glad you liked it. Will be making this one often! Thanks! Any suggestions if I prefer to use fresh unfrozen shrimp? This was soooo good! I made it last night for myself my husband and a friend. My friend asked if it was from a seasoning packet and she couldn’t believe it was from scratch. They both really loved it. I didn’t use shrimp, but instead used beef sausage and left over carnitas from another recipe. I also didn’t have any white wine so I just used more chicken broth. I also took another person’s suggestion and added green peas. First time I’ve ever had paella and it was so darn good! I’ll be making this gain for sure!